When you think of the Ice Age, chances are all you see are sweeping expanses of frozen tundra, but there's more to ice ages than just well, ice. Ages, you say? Yip, you read that right. There have been about 11 different ice ages that have occurred during the earth’s 4,6 billion years of existence. The last Ice Age was called “The Great Ice Age”, and it occurred 11 000 years ago. During this time, over a third of the earth was covered in ice, and the air had less carbon dioxide in it. Some ice ages may have been quite warm. Yes, the name “ice age” may suggest otherwise but even so, some may suggest that they weather was warmer than expected. Because of greenhouse gases which keep the heat of the sun in the atmosphere which heats up the planet, this heat is retained. Ice still begins to form because after the pollution gets thick enough, it might start bouncing the Sun’s rays back in space. Experts say this would turn the world into a giant “Baked Alaska” dessert—cold on the inside (ice on surface), hot on the outside because of the warm atmosphere. Even with the cold conditions, the ice age saw quite a few awesome animals roaming the earth during its time. These included the likes of the woolly mammoth, woolly rhinos, cave bears, horses, wolves, bison and reindeer. Woolly mammoth, cave bear, and woolly rhino are now extinct, but we know they existed during the Ice Age because people painted pictures of these animals on the sides of their caves. The skeletons of the animals have also been found. Cuts in these bones, from the hunters’ knives, were found and in some cases, the knives had been left sitting next to the skeleton. ... And everything started to melt. Approximately 10 000 years ago, as the earth began to warm up and the ice started to melt leaving lakes and valleys with a mixture of rocks and soil. The only ice that was left was up high in the mountains. The glaciers that exist today are left over from the last ice age. 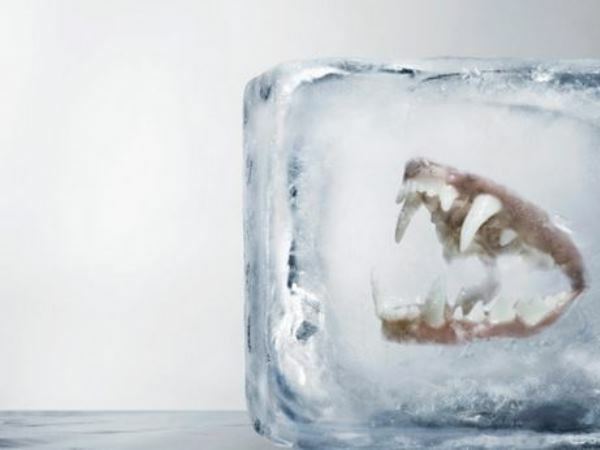 Scientists have a number of theories about why they think the ice age came to be. They say that because of the extreme cold, it never rained but snowed instead. The other reason is because the earth changed its tilt, moving away from the sun. We earlier mentioned the evidence of ice on some mountains, these are a result of existent glaciers left from the ice age. Glaciers are sheets of ice that cover rivers and valleys. The ice would begin to melt and then refreeze. This process went on for millions of years. For more exciting facts about the Ice Age be sure to visit the Ice Age Exhibition website, proudly brought to you by Huisgenoot, YOU and Drum.